Abbas, high-ranking PA official condemn murder in Israeli press - but still continue to endorse terror against Israelis. Two separate Palestinian Authority (PA) officials condemned the murder of Chief Superintendent Baruch Mizrahi hy"d on Wednesday, in a move critics say is designed to bolster their image following the drama surrounding failing peace talks. 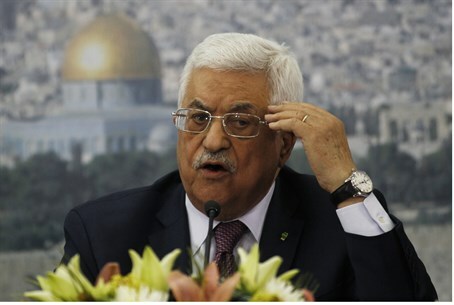 PA Chairman Mahmoud Abbas was the first to condemn the murder, as well as "all other terror attacks," during a session with Israeli Knesset members in Ramallah, according to Walla! News. Later, PA Minister of Religious Affairs Mahmoud Al-Habbash met with Israeli journalists and condemned the murder on IDF Radio. "This Israeli who was murdered, it hurts [. . .] we condemn the killing of any person," Al-Habbash stated. "The principle of killing and violence is completely unacceptable." Palestinian Media Watch notes that both statements defy the PA policy of encouraging incitement against Israelis, as well as the continued glorification of Palestinian Arab terrorists. Al-Habbash, in particular, is the subject of scrutiny for calling the terrorists "prisoners of freedom" in a live television broadcast two weeks ago. "All the Palestinian prisoners who protected [our] land, honor and homeland are prisoners of freedom; they are prisoners of war. They are not criminals, will never be and have never been," Al-Habbash stated. "Their hands committed no crime. They were defending themselves. They are an inseparable part of this national Palestinian movement and one of its authentic elements." Last month, the PA allocated another $74 million to the families of terrorist 'martyrs,' despite suffering from 4.8 billion dollars in debt. The pledge was announced just a few weeks after news surfaced that a man had killed several Jewish Israelis for financial reasons, using the stipend money as an incentive to fund his own wedding. The Israeli government only recently released its annual "Palestinian Incitement Index", which showed that incitement against Israel and the Jewish people is continuing on official media channels including - inter alia - by bodies that are very close to the PA Chairman and in educational and religious networks. Such incitement ranges from the glorification of Nazism and the lionization of Adolf Hitler, to programs on official PA television featuring heavily-stereotyped Jews as villains (and encouraging violence against them), and various TV and radio shows which literally wipe the Jewish state off the map. Prime Minister Binyamin Netanyahu explicitly linked Mizrahi's murder with the incitement Tuesday night. "This reprehensible murder of a man who was traveling with his family to a meal for the Festival of Freedom is the result of the incitement for which the Palestinian Authority is responsible," he said. Israel later cancelled a planned meeting with PA negotiators to continue talks in light of the murder.